The tiny mountain principality of Andorra sits atop the Pyrenees between France and Spain. 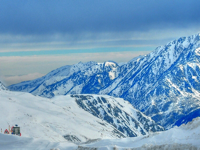 In the last decade or so, it has become a world favourite for winter sports enthusiasts helped along by its good snow, sunny clear weather and unreal natural beauty. Another plus is the fact that the tiny country's mountain resorts are just a short hop away from Barcelona International Airport, and close to the French border. Pick of the Andorran holiday resorts is Pas de la Casa. Set at an altitude of 6726 feet (2050m), this lively resort town is well-served by a hi-tech lift system which has been linked to the nearby Soldeu resort, providing miles of pistes suited to all levels of skiers and snowboarders. Snow conditions here are excellent, well maintained with top-notch snowmaking, and the resort rarely closes before April. Pas de la Casa, or 'Pas' as it is fondly known by loyal regulars, can hardly be described as picturesque, consisting mainly of modern, unattractive box-like apartment blocks and hotels. But all the accommodation and facilities are conveniently situated near the slopes and provide all the trappings necessary for a rollicking winter holiday at affordable prices. Pas de la Casa, like the rest of Andorra, stands out as one of the world's best duty-free shopping enclaves, its shopping precinct a gold mine of holiday bargains. There are, of course, sports shops for snow gear like the multi-storey Olympia Esports, but shoppers here also stock up on electronic goods, perfumes and cosmetics, designer clothing, photographic equipment, and car and motorbike accessories, from tyres to leathers. With dozens of restaurants cooking up a storm in and around the Pas de la Casa holiday resort, no one working up an appetite on the slopes need go hungry. Local cuisine is largely Spanish (with paella as a favourite) but there are plenty of French influences on the local menus. For views of the competition action and competitive boarding courses, one can even dine on high, with many restaurants on the slopes offering panoramic views and delicious meals. Dozens more cafes and restaurants in town offer everything from quick snacks to gourmet delights. Pas de la Casa stands out as one of the clubbing and bar havens of Europe, keeping the young crowd partying throughout the night with throbbing music and cheap drinks. Local bars can often extend happy hour to extremes. Skiing and boarding in Pas de la Casa caters for everyone from the absolute beginner to advanced competition experts, with one green slope, 4 red runs, and 4 black runs on offer. Alternative snow fun includes snow-mobiling and tobogganing. There is plenty to do when you need time out from the slopes, with a gym, indoor and outdoor pool, movies, tenpin bowling, snow-shoeing, and hiking. Nearby there is a spa offering thermal baths, but there are other facilities in nearby resorts. The village is not much to look at and can become quite rowdy after dark. Not the best place for a family holiday with young children.